A recipe for muffuletta skewers. All the ingredients and flavors inside a muffuletta (aka muffuletta) sandwich on a stick. Great appetizer for game day or occasion. Layer 1 slice each of the ham, cheese, and salami. Roll up tightly and refrigerate for 1 hour. Slice each roll into bite-size pieces. Thread skewers with the pepperoncini, roasted red bell pepper, kalamata olive, cocktail onion, meat-and-cheese roll, another roasted red bell pepper, and Spanish olive. Place skewers in a baking dish. Drizzle with red wine vinegar and olive oil. Cover and refrigerate for 1 hour. 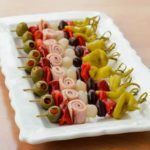 Transfer skewers to a serving platter and serve immediately.